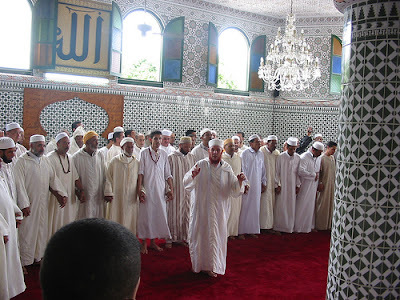 The Qadiria Order in Morocco is one of the oldest sufic traditions in North Africa and the Middle East. The First Qadiris we meet in the History of Sufism in Morocco are the decendents of Sidi Ibrahim, Sheikh Abdulqadir Aljilani's second son after Sidi Abdurrazak. This branch of the Qadiria had lived in Andalusia in Spain before they ran away from Grenada to Fes, where they were welcomed by their mureeds and many of the scholars and decendents of the Prophet Mohammad (peace be upon him).The second wave of Qadiris arrived in Morocco around the end of the 17th century. These were the descendents of Sidi Abdurazaq, the eldest son of Mawlan Abdulqadir Aljilani. They settled in the borders between the Ottoman and Sherifien Empires, then moved into Morocco as the Ottomans became more and more aggressive. The Beni Znaten Tribes around Oujda gathered around the Qadiria shrine at times of peace and war. As was the custom, the shrine functioned simultaneously as the Mosque, the court, and the social center for the poor, the handicapped, the homeless, and the orphaned. In times of peace, the Sheikh is a teacher and spiritual master, and his mureeds or disciples receive spiritual as well as worldly education. During wars, Sheikhs are preoccupied trying to “put out the fire of war” amongst the fighting parties. In the modern history of the Qadiria in North Africa, two main figures stand out as both Sufi Masters and leaders of Moroccan resistance against the French invaders: Sheikh Mukhtar Alkbir and his grandson Sidi Mukhtar Butshish. Sheikh Mukhtar Alkbir was a very close friend of Sheikh Amir Abdulkader of Algeria, known for his work on the Bezels of Wisdom of Ibn Arabi, entitled “The Attitudes”. Sidi Mukhtar Butshish, a twentieth century Saint whose sanctity the French themselves recognized after his capture in 1907.One of the well-known stories recently told by Sheikh Hamza about Sheikh Hajj Mukhtar is when he moved from the main shrine in the mountains down to the Trifa Valley. He built his new shrine in the forest and three robbers, very familiar with the forest, noticed the new building, as well as the Sheikh's horse and cow grazing.They agreed to take the cow, but before they left (as they were really hungry) they decided to go and ask for something to eat. One of the robbers remained hiding with cow while the other two headed toward the shrine. The Sheikh was there, as if waiting for them. He welcomed them and served them some food and inquired about their health and their families, and went back to his dhiker. The guests, after enjoying their meal, thanked the old man and were about to leave when he politely asked them to wait, disappearing inside the shrine only to come out with a loaf of bread, some butter, and some almonds. “Take this meal to your friend in the forest,” offered the Sheikh.The robbers looked at each other, amazed. They furtively thanked the man for his hospitality and hurried out of the shrine toward the forest. They told their friend the story, left the cow in peace and went on their way.Three months later, Sidi Mukhtar sent one of his mureeds to fetch this famous robber called Alhiresh and asked that he stop “harassing” people and become a sufi. Alhiresh's reply was, “I'm a poor man, and I live on 'this'. That's my only means of living.”Sidi Mukhtar answered, “Come and serve Allah and I will guarantee your living for the rest of your life.”“But I killed a lot of people!”“Follow the Path of the Beloved and be amongst them and refrain from anything else, and you'll see how Merciful He is.”The man's heart softened with Sidi Mukhtar's words and he joined the Sufi circle for the rest of his life. He died at the age of seventy-five, a beautiful, loving old Sufi Sheikh.